Peter Bell receives ASWA’s Grape Productivity Tray from Dave Barber. Photo by LInda Jones McKee. 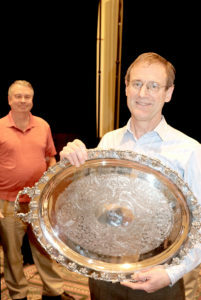 Mar 21, 2019 ASWA’s 2018 Wine Grape Productivity Tray was presented to Peter Bell at the 2019 Eastern Winery Expo. Peter is the longtime winemaker at Fox Run Vineyards in the Finger Lakes Region of New York and was honored for his knowledge, innovation, research, leadership and support of the American wine industry. Peter’s generosity in helping to mentor other winemakers and consulting on problems to increase the quality of the whole Finger Lakes area is notable. 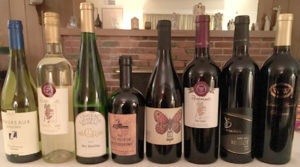 Anne Vercelli pours eastern wines at the 2019 Unified Wine and Grape Symposium. 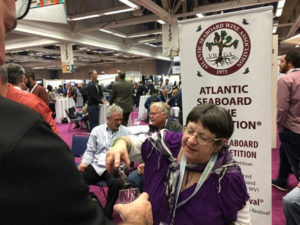 Jan 30, 2019: Atlantic Seaboard wines prove highly popular at this year’s Unified Wine and Grape Symposium. Anne Marie Vercelli and Dave Barber pour for the crowd. 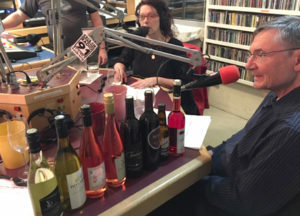 Dr. Andrew L. Waterhouse, Director of the Robert Mondavi Institute of Wine and Food Science and professor of viticulture and enology at UC Davis with Anne Marie Vercelli and Dave Barber. 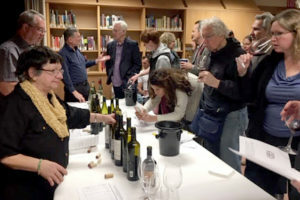 Jan 29, 2019: Grant Crandall and Dave Barber give formal presentations to enology students at UC Davis, followed by a walk-around tasting. Grant Crandall with Michele Anna Jordan on KRCB Radio. Jan 27, 2019: Grant Crandall, Dave Barber and Anne Vercelli join host Michele Anna Jordan on KRCB radio program Mouthful. Click to find out how to listen! Nick Frey receives ASWA’s Monteith Bowl from Grant Crandall and Dave Barber. Jan 26, 2019: West coast rep Anne Vercelli hosts the annual ASWA Monteith Award dinner. 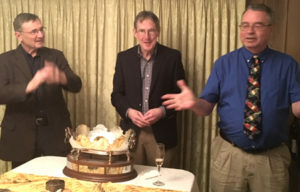 The Monteith Bowl was presented to Nick Frey by Grant Crandall (left) and Dave Barber (right). Nick Frey helped to put the Sonoma County winegrape industry on the world-wide map during his tenure as president of the Sonoma County Winegrape Commission and as executive director of the Sonoma County Grape Growers Association prior to that. Nick currently leads public relation efforts for Balletto Vineyards and serves on the Russian River Valley Winegrowers Board, Santa Rosa Junior College (SRJC) Viticulture Advisory Committee, SRJC Shone Farm Foundation Board and Sonoma County Harvest Fair Board. Grant Crandall on KSRO’s Good Food Hour. Jan 26, 2019: Atlantic Seaboard wines on the air! 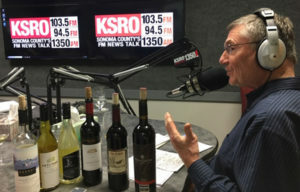 KSRO radio’s Good Food Hour http://www.ksro.com/episode/wine-hour/ hosted by Chef John Ash and Steve Garner speak with ASWA’s Grant Crandall and Dave Barber. Cooper Vineyards Boordy Vineyards Barboursville Vineyards The Barns at Hamilton Station Vineyards Jones von Drehle Vineyards & Winery Philip Carter Winery were sampled and discussed on this long-running west coast radio show. Dave Barber at Santa Rosa Junior College instructs on wine judging protocols. 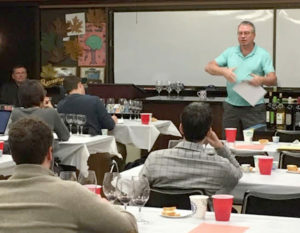 Jan 24, 2019: Dave Barber (right) and Grant Crandall (far left) present ASWA’s perspective at Santa Rosa Junior College’s wine judge training class. Anne Vercelli and Dave Barber pour at the Sonoma County Library. 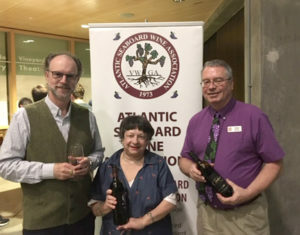 Jan 23, 2019: Sonoma County Library showcases Atlantic Seaboard wines as Grant Crandall and Dave Barber continue their west coast tour prior to attending Unified Wine & Grape Symposium. ASWA West Coast rep Anne Vercelli presides (left). Port of Leonardtown Winery Jones von Drehle Vineyards & Winery Casanel Vineyards and Winery Tomasello Winery The Barns at Hamilton Station Vineyards and more were featured. Eastern wines take their place on West Coast tables.